Welcome to the Kitzbühel Alps, our world-famous skiing region. Next to our main business at Pass Thurn we offer our usual alpine sport services at the valley-station of the panorama cable car Kitzbühel Alps, at Hollersbach and at the mid-station at Breitmoos. We are looking forward to your visit at one of our locations and wish you unforgettable holidays! Courses start every day during christmas season! Many attractions at "Magic forest!" An appropriate designed kids area "Magic forest" is waiting for its guests at Pass Thurn! 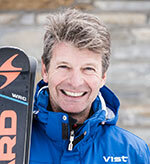 Stefan Volgger is successfully managing Stefans Ski- & Snowboardschule for more than 25 years. In the summertime the Alpine School has become a steady part of the company. ... also Freestyle/New School and children care taker to expand our team! Award for excellent service and outstanding quality.